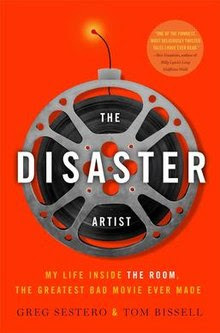 I thought I would conveniently write my first review for the last book I read since the launch of this website, which was The Disaster Artist: My Life Inside The Room, the Greatest Bad Movie Ever Made, a 2013 non-fiction book written by Greg Sestero and Tom Bissell. This is a book I have been wanting to read since it came out, but only just got to reading it after acquiring a copy from the author himself just a few weeks ago. In 2009 a local theater began showing midnight screenings of a movie called The Room, that seemed to be very popular because every screening would sell out quick. I didn't get around to seeing it at a midnight screening till around 2011, and from that moment forward I became sucked into a cinematic vortex I have not been able to escape, nor do I want to. Since then I have attended at least half a dozen midnight screenings, and the fascination with this film grows more and more each time. This is why, when the book about the film came out, I wanted to read it, but just never got to it. And then it was made into its own movie by James Franco in 2017, also called The Disaster Artist, which won a Golden Globe. The film adaptation of the book, which I saw twice in theaters, renewed my interest in the original movie The Room. For those who don't know, The Room is considered by many to be the greatest bad movie ever made. It was written, directed and starred by Tommy Wiseau, who is the jewel behind the fascination and who mysteriously self-financed the film, and it co-starred his good friend Greg Sestero. The movie of course bombed in its original run, but for many reasons a few years later it became a fascination and cult favorite, so that by 2009 it was selling out shows all around the world. It still sells out shows around the world, and because of the movie The Disaster Artist, it is perhaps even more popular. Now even though I have an autographed copy of The Disaster Artist, I decided not to read it, but to listen to the audiobook. And if you were to ask me, I would highly recommend the audiobook over reading the book itself, mainly because Greg Sestero himself reads it, and he does an excellent job at not only reading it, but also doing a fantastic impersonation of Tommy Wiseau that is dead on. The first time I listened to it in my car, I became so enamored and fascinated by it, that I literally drove around for four hours just to listen to it. I listened to all twelve hours within a week, and I look forward to listening to it again after I rewatch The Room at a future midnight screening, as well as The Talented Mr. Ripley and Sunset Boulevard (you will know why once you read/listen to it). As for what the book is about, Sestero details the troubled development and production of the 2003 cult film The Room, his own struggles as a young actor, and his relationship with Room director Tommy Wiseau. I highly recommend you catch a midnight screening of The Room before you read/listen to this book. Seeing the movie The Disaster Artist would help to. It was one of the most enjoyable book experiences I have had in a long time, causing me to run the gamut of emotions, seeing myself in much of it as well, so I highly recommend it. As a matter of interest for Orthodox Christians, though this book doesn't focus on spiritual matters, there are still some themes of interest. One of the main themes of this book deals with following after your dreams, and the pitfalls and perils you go through to achieve your dreams. Greg Sestero does a really good and careful job maintaining this theme throughout the book. It is also a book about friendships and relationships, both the positive and negative aspects. The book also tackles the issue of a being a leader, and how much of a toll a controlling person can have on you when they have a certain advantage over you. Furthermore, Tommy Wiseau is a Catholic, and in the book he recounts what he believes to be a miracle that happened to him while living in France by which his life was saved, and how his faith in a loving God pushed him through difficult times in his life, especially in his escape from communist eastern Europe, where he says he is from, though we are not told exactly from where. Also, interestingly, when Sestero is describing a scene in The Room where a lot of candles are lit, he describes it as being lit "like a Greek church".